There's lots to do to get ready for a new school year to start. New school supplies, like everyone else, but there's lots more for a homeschooling family. A curriculum must be decided upon and ordered, last year's books to pack away, this year's books pulled out and organized, the school area decided upon and cleaned up. And in our family, the bedrooms must be cleaned and organized. It's hard enough to concentrate on schoolwork when your stuff is around to tempt you, but when you can't even *find* the top of your desk to do your work? That's when you know something has to be done. Last night I started on L's room. L is a packrat. She will save every piece of paper she draws on or writes on or gets from Sunday school. She saves every cheap plastic toy or broken necklace and it all gets crammed into whatever nook and cranny is available. We make the girls clean their rooms often, but their idea of "clean" is not exactly the same as my idea of "clean". I went in armed with trash bags and wipes and we went to work. Don't think I do it all myself, the occupant of the room is required to act as messenger and "go-fer". She tries on clothes and sorts through toys. She cleans surfaces and runs the vacuum until Mommy is satisfied that the floor is clean enough. She gets to help decide the placement of furniture and wall-hangings as needed. We took out 5 trash bags worth of papers, clothes, and toys. In spite of her hoarder tendencies, she had no problem with me tossing things. There were, I admit, a few things I tossed quickly into the trash bag when her back was turned, but she was very cooperative about everything. 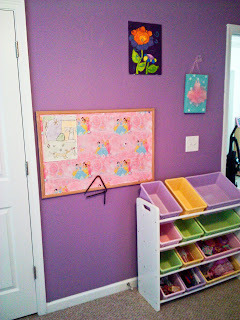 L's room is now back to it's normal pink and purple princess fairyland with a few changes from before. A reorganized closet came first. The short shower curtain rods have been awesome since they allow L to reach her own clothes and the hanging shoe organizer is new. 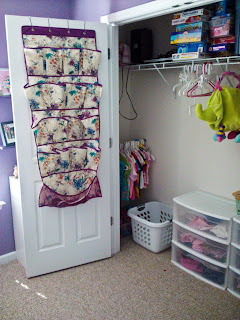 Of course, now the door won't shut with the hooks, so I've got to find another solution to hang it. L had asked if she could have a bed that looks like a couch during the day. After informing her that I was not buying her a daybed, I told her I could probably make her existing bed work. She was very happy with the result. See all these empty toy bins? I'm still trying to figure out how to use them. Mr. at Home wanted to make sure L realized that just because she tossed some old toys it didn't mean that we'd buy her new ones. One thing I kept finding all over the floor was feathers from L's boa, so I put it up over the window to keep it away from small destructive hands (and cats. and puppies.) I had to rehang that bottom shelf due to those same destructive hands. 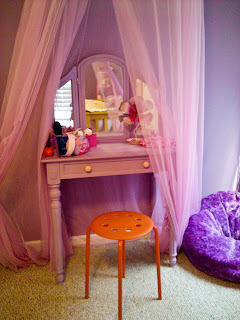 I took the ratty make-up table I bought at the garage sale and painted it purple, put a clear coat on the top, added some pink drawer pulls, and put it under the pink net that was already hanging from her ceiling. L LOVES it. She carefully arranged her jewelry and hair stuff on top and sat eagerly in front of it. She isn't thrilled about the orange stool, but it was all I had to offer. Tonight we started on K's room. After a few minutes, I realized that her room is even worse than L's had been. I've already taken out 3 bags of trash and we've barely started. 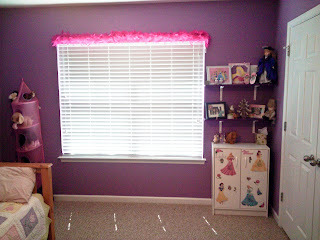 Maybe in a day or two I'll be back with pictures of her newly cleaned room. If not, you might want to come make sure I'm not buried under a mound of stuffed animals. But at least it would mean I wouldn't have to worry about getting ready for school.